In these days of rising prices and shrinking paychecks, Naples parents are trying to save money wherever they can. They shop sales for food, clothes, school supplies, and other necessities. Many Naples thrift stores have seen their business increase in the past few years as parents have discovered how much money they can save by buying used items. Perfectly good toys, clothes, books, sports gear, and children’s furniture can be purchased for a fraction of retail price at Naples thrift stores. One place Naples parents should not scrimp, however, is on their child’s car seat. If you are considering buying a used child safety seat, make sure it comes with the user’s manual, the model number, and date of manufacture. 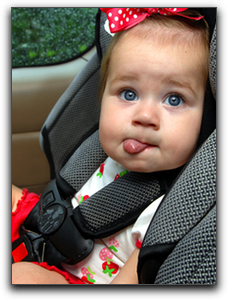 You want to be certain that you know the complete history of the car seat. Check to see if it is on the list of recalled products. (Information at http://www.carseat.org/Recalls/recall.shtml.) If it has ever been involved in anything more severe than a low-speed fender bender, don’t buy it. For more information about children’s safety in Naples, or my favorite nutritional product, contact me today at 941-216-5727. PreviousThank You, Bill O’Reilly, From Beyond In Punta Gorda & Naples Florida!